Why the heck is this happening to us? What happened to mortgages, to banks, to large retailers, to retirement savings, to stock prices, to the availability of credit? How could so many errors have coincided? To the media pundits and government officials, this is a market failing that requires the government to take trillions of dollars from you and run the money presses full time. Otherwise we are doomed. But there is another way to look at the great market collapse of 2008: the whole thing, including the bubble that preceded it, is the fault of the government and the Fed. All attempts to "fix" the problem are like forcing the patient to swallow more of the poison from which he currently suffers. Mises.org has been making this argument, and warned of the coming crash years ago. But where can you find the argument explained for the average person in a convenient package, without technical jargon and with logic and facts? Enter Tom Woods with his blockbuster book Meltdown. It's all here, all the information you need to understand what is happening and what to do about it. It is billed as a free-market response to the crisis but it is more precisely an Austrian School response. He covers the problem of housing subsidies, of low interest loans, of the absurdities of the boom times, and how it was inevitable that they would come to an end. He puts the fault right where it belongs: with the government and the central bank. He further blasts the political establishment for taking exactly the wrong path in response. Interest rates should be raised, not lowered. Government spending should be cut, not increased. Tax should be reduced. Regulations should be cut, not expanded. On the current path, the bozos in Washington are going to wreck whatever hope for recovery there is. The great thing about this volume is that it is rooted in serious ideas. We aren't talking about some quicky investment book by a media talking head. Professor Woods is steeped in the ideas of Mises, Hayek, and Rothbard, and never misses a chance to explain the relationship between theory and reality. It contains what might be the clearest explanation of Austrian business cycle theory ever written. This book is a fantastic weapon in the intellectual battle that is taking place right now. It needs to become a bestseller, and it could. You can do your part by distributing it as widely as possible. History really does hang in the balance. The media tells us that "deregulation" and "unfettered free markets" have wrecked our economy and will continue to make things worse without a heavy dose of federal regulation. But the real blame lies elsewhere. In Meltdown, bestselling author Thomas E. Woods Jr. unearths the real causes behind the collapse of housing values and the stock market--and it turns out the culprits reside more in Washington than on Wall Street. And the trillions of dollars in federal bailouts? Our politicians' ham-handed attempts to fix the problems they themselves created will only make things much worse. Woods, a senior fellow at the Ludwig von Mises Institute and winner of the 2006 Templeton Enterprise Award, busts the media myths and government spin. He explains how government intervention in the economy--from the Democratic hobby horse called Fannie Mae to affirmative action programs like the Community Redevelopment Act--actually caused the housing bubble. Most important, Woods, author of the New York Times bestseller The Politically Incorrect Guide to American History, traces this most recent boom-and-bust--and all such booms and busts of the past century--back to one of the most revered government institutions of all: the Federal Reserve System, which allows busy-body bureaucrats and ambitious politicians to pull the strings of our financial sector and manipulate the value of the very money we use. Meltdown also provides a timely history lesson to counter the current clamor for a new New Deal. The Great Depression, Woods demonstrates, was only as deep and as long as it was because of the government interventions by Herbert Hoover (no free-market capitalist, despite what your high school history teacher may have taught you) and Franklin D. Roosevelt (no savior of the American economy, in spite of what the mainstream media says). If you want to understand what caused the financial meltdown--and why none of the big-government solutions being tried today will work--Meltdown explains it all. An outstanding introduction to Austrian economics. 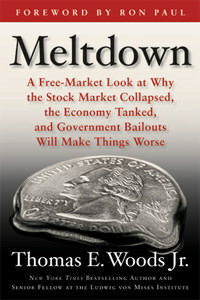 On that framework, this book is a must-read for anyone who wants to understand the 2008 meltdown. Not only that, but this book gives the novice reader an understanding of just why booms and busts happen in the first place. The only complaint I have is that the first chapter tends to use the terms "liberal" and "conservative" too much, as though those terms have much meaning anymore. Furthermore, Mr. Woods tends to give Republicans a little too much credit when it comes to Fannie and Freddie. The rest of the books, however, does a tremendous job of showing that both political parties are equally responsible for economic destruction. I would love to see a second edition, but it might be a good idea to wait until Europe melts down before updating this text. This was a fantastic book - well worth reading (even worth reading more than once). It was simple, but not insulting. I recommend buying this book. This is a wonderful book to read if you want to know the reasons and economics behind not just the current financial crisis but also explains the austrian business cycle theory which is applicable to the majority of past recessions. The reader doesn't have to be an econ major to grasp the wonderful thoughtfullness and beauty of the theory, and Woods does an exellent job presenting it in a accessible and witty way. There is however some additional gouvernmental interventions which impacted the crisis that isn't covered in the book. However one ought to remember that Woods was maybe the first to release a book in the defence of the free market after the crash. And that I salute him for. This is the most important contemporarily published book on the economy that you can read. It should be required reading for every American! It has been a long time since I enjoyed reading a book this much. It lifts the 'fog of war' surrounding the current debacle and clarifies the root cause. It has validated many suspicions and concerns created by the lack of serious media attention on the government's culpability. My only regret is that it fails to explore possible ways to prepare for the consequences of continuing with the current system. An easy read! A blockbuster of a book that sought to explain the crisis of 1972.